Portencross Castle is built on the Firth of Clyde and dates back to the 14th century. It faces the islands of Bute and (a little further away) Arran. The castle was scheduled in 1955. It is now managed by the Friends of Portencross Castle who have been able to open up the castle with the support of HLF and Historic Scotland. During the Second World War the castle was surveyed by Vere Gordon Childe. I have noted before the official guidebook for Skara Brae on Orkney. The original edition by V. Gordon Childe dated to 1933, and the guide was revised in 1983 (D.V. Clarke with [the late] V. Gordon Childe). This 1983 edition was fully illustrated (in black and white), with sections on The site revealed; the best in northern Europe; the village and its inhabitants; a guided tour. This guide was published by HMSO. The guidebooks is sponsored and supported by Gateway supermarkets. This was replaced by the Historic Scotland Guide prepared by David Clarke and Patrick Maguire. It is subtitled ‘Northern Europe’s Best Preserved Prehistoric Village’. It starts with a ‘Guided Tour’ and then a series of sections on the settlement: ‘The preservation of Skara Brae’, ‘About the houses’, ‘In the midden’, ‘The workshop’, ‘The way of life at Skara Brae’, and completes with ‘How the story came to light’. There is a note ‘About this booklet’ that explains the difference between ‘undoubted fact’ and ‘speculation’. The guide is completed with ‘Some commonly asked questions’. David Clarke is the author of the Historic Scotland guide (2012). This is fully illustrated, in colour, and includes plans and reconstructions. There are three main sections: guided tour; life at Skara Brae; understanding Skara Brae. The guide includes a section on the local wildlife. Ri Cruin Cairn is one of the Early Bronze Age burials in Kilmartin Glen. Although damaged by the construction of a lime kiln, it was the subject of a series of excavations, including one by V. Gordon Childe in 1936. The site is in state guardianship and now is in the care of Historic Scotland. The photograph, dated to July 1985, shows the Ministry sign located on the edge of the cairn. (This is a scan of the print.) The sign has since been removed. The Edinburgh Castle blog has reflected on the evolution of the guidebooks to the castle and it made me realise that there is little here so far on guidebooks from Scotland. One of the few was the foldout guide to the Antonine Wall (a companion to a similar one for Hadrian’s Wall). This ‘blue’ guide is the eleventh edition (1977) of the third edition (1950) written by the prehistorian V. Gordon Childe. The guide was printed in Edinburgh by HMSO (30p) and it follows the standard blue format for sites ‘held in trust for the nation by the Secretary of State for Scotland and cared for on his behalf by the Department of the Environment’. 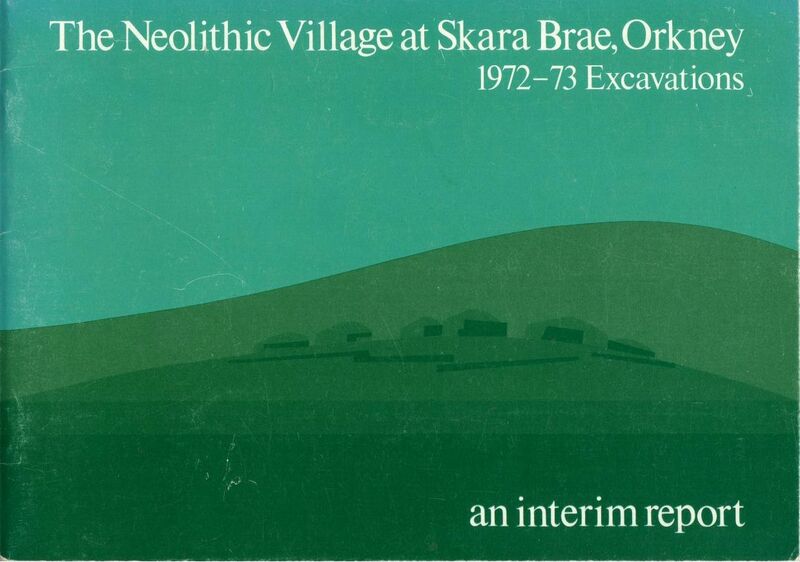 The subtitle, used since 1950 was Ancient dwellings at Skara Brae. 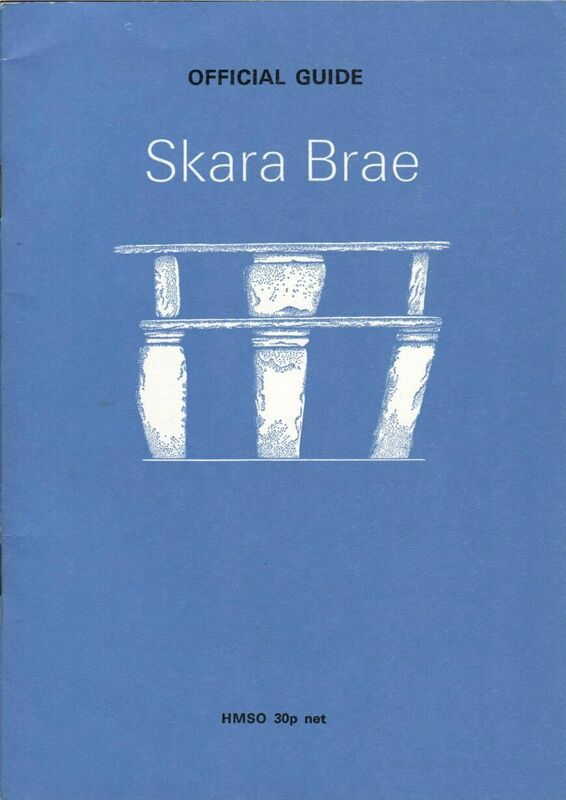 The ‘Preparatory note’ informs us, ‘This guide is intended to simplify a visit to Skara Brae’. There is a foldout-plan along with sections through the settlement. The Department of the Environment (DOE) also published an interim report, The Neolithic Village at Skara Brae, Orkney. 1972-73 Excavations (Edinburgh: HMSO) by D.V. Clarke. The landscape format (and size) is identical to the DOE guide to the Saxon Shore.